LessThanPi Art: Jhin From League of Legends: Quick Study and Secrets Revealed! Jhin From League of Legends: Quick Study and Secrets Revealed! Just did a quick study tonight on Jhin, the supposed new champ from League of Legends. I wanted to share him and a few ideas I had on the character with you. So jump in let me know what you think of the piece and look forward to a process video in the near future on this one. 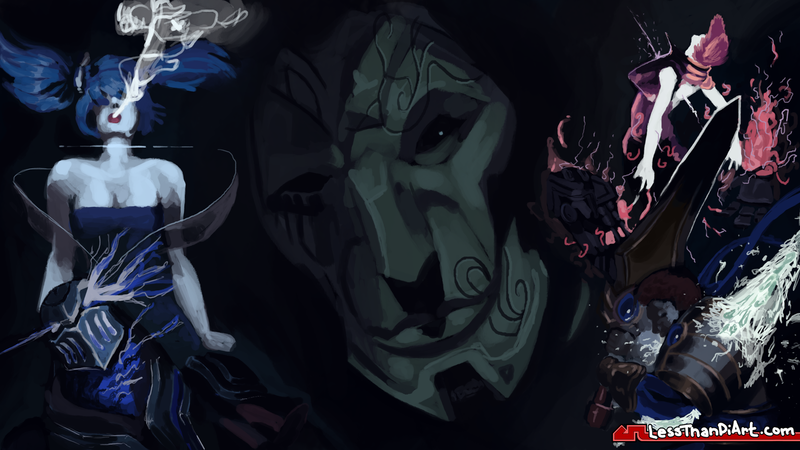 And, of course, once we get a full reveal I'll probably end up doing my own take on the champion like what I did with my Poppy and Illoai paintings! Hey! Before you check those out though make sure you fiinish up here. I have a unique take on Jhin that not many other have thought about just yet that I know will blow you mind! I like a lot of the League of Legends fan have gotten caught up in the Jhin hype these past few weeks. While scrolling through Surrender @ 20 I came across this post by Kaktsusplay. This immediately caught my attention and made so much sense to me! So I’m not much of a theorist but I was working so hard to figure out a connection between Vi, Garren, Zed, and Sona and I couldn’t for the life of me… nothing added up. But I think this is definitely it! Prudence aligns perfectly with Zed. Assassins are patient and cunning but decisive, and I think Zed is the ultimate depiction of that in the league. Initially when zed was shot in the eyes I didn’t know what to make of it. But if in fact this new Jhin character was aiming at what Zed represent then in makes so much more sense… If you take away his sight you also take his ability to make sound decisions. As a game play element I think this is going to be represented as a blind. I think this represents Sona. Sona seems to be the most at peace in the league I think her inability to speak in combination with her upbringing helped to shape a very patient character. I believe Sona best fit the idea of temperance. Now I believe that Jhin was targeting sona’s restraint. I think the image we are shown is actually everything she hasn’t said spilling out of her mouth. Though I also feel this will be represented as a silence in game. Without doubt this goes to Garen. Garen has always been the poster boy good guy of the league. With moves named judgment and Demacian Justice he clearly aligns with this virtue. We saw Garen get struck through the heart. I think that too was an attack on Justice itself, for millennia has been directly tied to our direction in life so that is where justice would be hit the hardest. This is the hardest status effect to pin, but given the graphics we’ve seen I’d guess a root or a stun. I think of all the characters that embody this virtue Vi is really at the forefront. I’ve always thought of her as courageous to a fault, and she quite literally wears her strength on her sleeve. I think burning away Vi’s gauntlets weren’t just an attack on her strength! But also an attack on yep you get it by now, courage and I think in game that will be represented as a fear. I think Jhin, if that’s even his name. Is going to be a really scary guy, I think he is really going to get into the minds of not only the champions he is fighting against, but the people summoners playing as and with him as well. I think he is going to be an ADC that trades high damage for powerful CC effects that scale with his attack damage. Well guys as always God bless, be safe. And remember; follow your dreams! You are never to old, and you are never too young!